The first objective of the actions in T2M is to optimize the unit cost for searches performed by users through the form on their sites. Twitter Tech Marketing (T2M) is a solution developed by the Cyberclick team to optimize Twitter Ads. It uses artificial intelligence to create microsegmented campaigns that obtain optimal results due to its machine learning and real time capabilities. 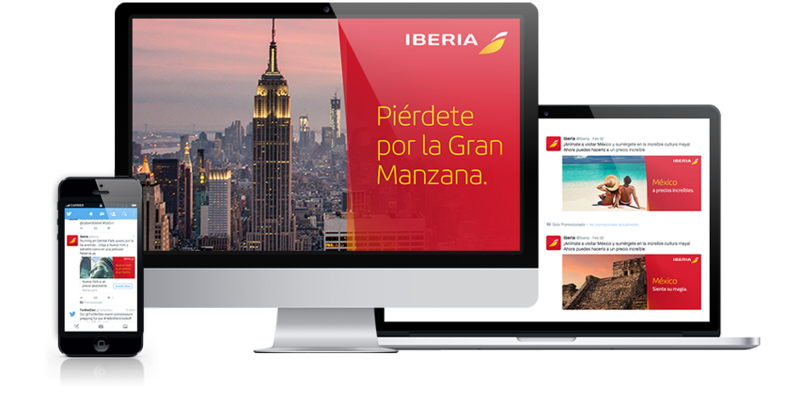 From the performance marketing team, Iberia continues to promote the growth of reservations in all its top routes originating in Spain, other European markets and Latin America. The first objective of the actions in T2M is to optimize the unit cost for searches performed by users through the form on their sites. Second, the challenge is to understand the user behavior in terms of final conversion (purchases), and thanks to an invaluable tool we impacted the mobile audience in terms of quality, since most purchases of this type of service are still made from desktop. To date actions have been designed in Spain, France, Brazil and Germany, establishing stages for progressive tests for all routes and top destinations in the largest number of target microsegmentations, which we can access with T2M. In the first stage of the campaign, all campaigns are issued type always on, that is, they show generic messages not related to any specific period of time, also in line with the milestones in the company’s branding. In their schedule, the second stage of the shares is carried out by the so­called real­time Ads that show locations with specific prices in real time and in line with the offers that the company activates daily. We are pioneers in the development of integration with the repository of airline pricing, which allows us to display completely dynamic information on sponsored tweets (images, copies of destinations and prices). This competitive advantage will allow access to the target audience through the ads to the latest deals and also provides interesting last minute flight proposals to everyone. The geo campaigns in Spain include a large number of domestic and European routes, and progressively amplify a wider range of international destinations such as New York, Mexico, Miami and Santiago de Chile. 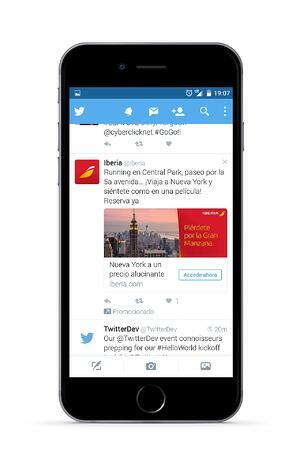 For each of the destinations, T2M performed testing of different varieties of copies and images in the tweets, so that we can quickly figure out which ads get more interaction. In turn, more than 1,000 targets are active across all campaigns in live. More than 70,000 visits to different landing pages have been generated from the ads. The CTR’s are currently around 0.25%, especially highlighting the airline’s premium destinations such as New York’s remarkable CTR exceeding 0.60%. The reactivity of users that have clicked, once they reach the site, is very high in conducting searches, having produced nearly 27,000 requests of availability from the forms (38.5% conversion regarding the visit). If we focus on profitability searches, and take a conservative base, the data tagged by Google Analytics (uni­device unique users), we are getting unit costs below 1€. This represents 10 times less cost than that obtained in previous actions taken by the company in other channels of compelling mobile traffic such as Facebook. This gives us a very positive indicator in terms of ROI and longevity of actions over time. Already in the last stage of testing, reservations (purchases) made by users after these searches represent 2.07% of all visits. 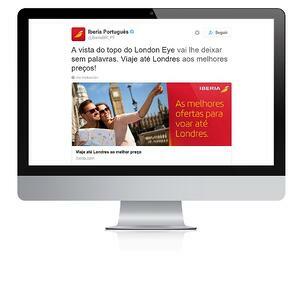 The campaigns done and located in Brazil are exploring a total of 350 different segmentations. To date there have been 22,000 visits sent to the site from searches, and the overall CTR stands at 0.25%, similar to the Spanish market. The best CTR’s of the Portuguese market are being achieved, among with the Barcelona destination. The percentage of searches in the Portuguese market is lower than that of the Spanish market. Due to this the cost per search is higher but still within the objectives, which the company marked within this channel. This, to date, has been compensated with the conversion (purchase) rate of 1% with the final purchase amounts much higher in comparison with Spain since the main routes advertised were transatlantic.